Cognitive behavioural therapy (CBT) is a short-term, structured psychological treatment used for a range of psychological disorders, including depression and anxiety. It can be administered in an individual or group setting. CBT suggests that the way we think (our thoughts or cognitions) and act (our behaviour) affects the way we feel (our emotions). CBT involves working collaboratively with a psychologist to identify thought and behaviour patterns that might be causing anxiety, or stopping an individual from getting better when they are experiencing anxiety. Once these patterns are identified, changes are made to replace these with new, more adaptive patterns that assist in reducing anxiety and developing coping skills. How CBT is applied, varies according to the problem being addressed. However, at its core, it is a collaborative and individually tailored therapy that help individuals to identify unhelpful thoughts and behaviours, and learn new, more adaptive coping skills. Although CBT is primarily used in the treatment of anxiety and depression, it is not limited to these disorders. CBT is also commonly used in the treatment of substance abuse, posttraumatic stress disorder, and other mood disorders. CBT is one of the most extensively researched and empirically supported forms of psychotherapy. Dialectical Behaviour Therapy (DBT) is a comprehensive cognitive-behavioural treatment for complex mental disorders. It is a psychological therapy designed to help individuals change unhelpful patterns of behaviour including self-harm, suicidal ideations, or substance abuse/misuse. DBT is a modified form of CBT which was initially created to treat individuals with Borderline Personality Disorder and those with extreme suicidal ideations. The use of DBT has now been generalised to treat individuals with eating disorders, traumatic brain injuries, and severe mood disorders. 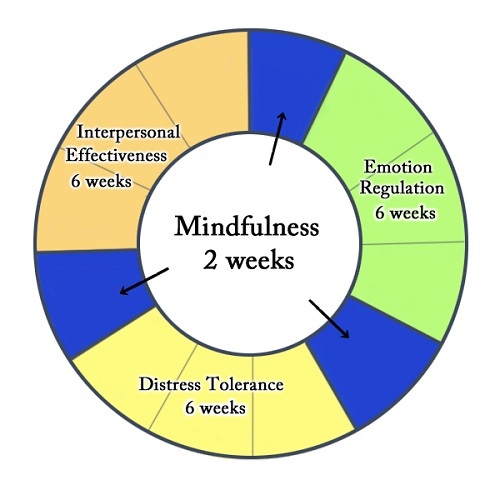 DBT combines standard CBT techniques for emotional regulation, with concepts of distress tolerance, acceptance, and mindfulness. It is the first therapy that has been empirically proven to be effective in the treatment of Borderline Personality Disorder. The theory behind DBT, is that some individuals are prone to reacting in a more intense or extreme manner towards certain situations, and may also take much more time to return to baseline arousal levels, than other individuals. This approach works by helping people increase their emotional and cognitive regulation. This is done through learning about triggers that lead to reactive states, and helping to assess which coping skills to apply to a particular sequence of thoughts, feelings, and behaviours, in order to prevent maladaptive reactions. DBT assumes that individuals are either lacking the skills to regulate their emotions effectively, or are or influenced by positive/negative reinforcement that interfere with their ability to function appropriately. CBT is one of the most commonly used therapeutic options used worldwide. Contrastingly, DBT is a specific form of CBT, which aims to build upon the foundations of CBT, to further enhance its effectiveness and address specific concerns that CBT may not target. CBT is a ‘gold-standard’ treatment for helping individuals with diagnoses such as depression, anxiety, and substance use. However, clients with more complex difficulties such as self-harm, suicidal ideations, and personality disorders, are likely to benefit more from DBT. Essentially, DBT was developed out of a need to help more complex individuals, when mainstream therapies such as CBT failed. Although CBT examines psychosocial aspects of the client’s current circumstances, DBT places a strong emphasis on the psychosocial aspects of treatment. This includes how a person interacts with others in various environments and/or relationships. The theory behind this, is that some people’s arousal levels in specific situations increase far more rapidly than is considered typical. This can result in a person attaining a much higher level of emotional stimulation than normal, and can therefore take longer to return to normal levels of arousal. DBT differs from CBT in an important way. While CBT is generally either an individual treatment or group treatment, DBT incorporates weekly psychotherapy sessions with an additional weekly group session. These group sessions are used to help individuals learn skills through four different modules: interpersonal effectiveness, distress tolerance/reality acceptance skills, emotion regulation, and mindfulness skills. A group setting is an ideal place to learn and practice these skills, as it offers a safe and supportive environment for disclosure and learning. Emily Habelrih. "The Difference Between CBT and DBT." DifferenceBetween.net. October 12, 2017 < http://www.differencebetween.net/science/health/the-difference-between-cbt-and-dbt/ >.